A baseline building is not used when COMNET is used for Design to Earn ENERGY STAR. The HVAC system in the baseline building depends on the primary building activity, the size of the building and the energy source used for heating in the proposed design. 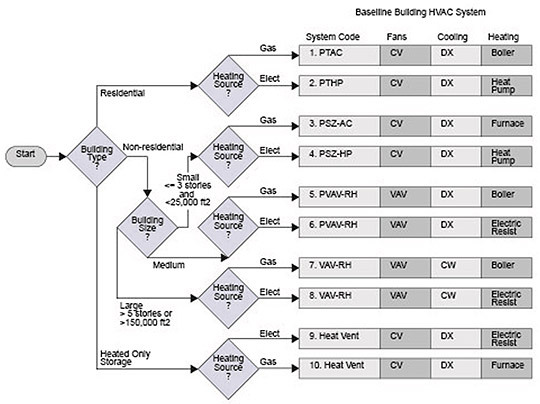 [bookref id="hvac-mapping"] shows the HVAC system types that apply in each case. Details about these systems are provided in subsequent sections. Many of the building descriptors have a one-to-one relationship between the proposed design and the baseline building, for example, every wall in the proposed design has a corresponding wall in the baseline building. For HVAC systems, this one-to-one relationship generally does not hold. The HVAC system serving the proposed design and the baseline building may be completely different, each with different components, etc. For systems 1 through 4, each thermal block shall be served by a separate system. For systems 5 through 8, a single system serves the whole building with a separate air handler for each floor. Systems 5 and 6 are packaged equipment with DX cooling and fans combined in the same box. For these systems, each floor will have its own system. These special systems serve just the spaces that trigger the exceptions. The rest of the building/floor is served by the baseline building HVAC system and air handlers shown in [bookref id="hvac-mapping"]. The HVAC system in the baseline building depends on the primary building activity, the size of the building and the energy source used for heating in the proposed design. Figure 6.1.2-1 shows the HVAC system types that apply in each case. Details about these systems are provided in subsequent sections. For systems 1 through 4 and 9 and 10, each thermal block shall be served by a separate system. For systems 5 through 8, a separate air handler shall serve for each floor. Systems 5 and 6 are packaged equipment with DX cooling and fans combined in the same box. For these systems, each floor will have its own system. There are several important exceptions to the HVAC mapping rules that apply to spaces with unusual internal heat gains, different schedules, special pressurization requirements, or unique outside air needs. Mixed residential and nonresidential buildings. If a building has both residential and nonresidential spaces with their total conditioned floor area greater than 20,000 ft², such as a residential tower with retail and restaurants at the base, then the HVAC system type is determined separately for the residential and nonresidential portions. Special spaces in buildings. Examples are computer rooms or guard stations. In these cases, the baseline building system for the special space is system type 3 or 4, depending on the heating source for the main building. This exception applies when a space has significantly different operating conditions or thermal loads. The threshold for internal loads is a difference of more than 10 Btu/h-ft². The threshold weekly operating hours is when the difference is more than 40 hours. Laboratories. For laboratory spaces with a minimum exhaust of 5,000 cfm, the HVAC system type should be 5 or 7 (depending on heating source) serving only the laboratory spaces. For all electric buildings, the heating is electric resistance. Kitchens. Baseline building systems that serve kitchens with an exhaust hood airflow rate greater than 5,000 cfm shall use either baseline building system 5 or 7. System 5 is a packaged VAV and 7 is a VAV with a chilled water plant. System 7 would be used if the baseline building has a chilled water plant, otherwise system 5 would be used. The baseline building shall have a demand ventilation system that operates on at least 75% of the exhaust air. The system shall reduce exhaust and replacement airflow rates by 50% for one half of the kitchen's occupied hours. If the proposed design uses demand ventilation, the same airflow schedule shall be used. Heated only spaces. A heating and ventilating system (with no cooling) shall be used for heated only storage, stairwells, vestibules, electrical/mechanical rooms and restrooms not exhausting or transferring air from mechanically cooled thermal zones (systems 9 or 10). When unheated storage or other qualifying spaces exist in a building, the remaining spaces are modeled as heated and cooled and follow the system map in Figure 6.1.2-1. The floor area to be used in determining the baseline building system types should exclude the heated only spaces. Purchased heat, but not purchased chilled water. The purchased heat is assumed to be produced by fossil fuels, and the mappings in Figure 6.2.1-1 apply with purchased heat substituted as the heating source. Purchased chilled water is substituted for the cooling source. Systems 1 and 2 are constant volume fan coil units with fossil fuel boilers. Systems 3 and 4 are constant volume single zone air handlers with fossil fuel furnaces. System 7 is used in place of System 5. System 8 is used in place of System 6. Purchased heat and purchased chilled water is substituted for the heating and cooling sources. System 1 is constant volume fan coil units. System 3 is constant volume single zone air handlers. The HVAC system in the baseline building depends on the building type, the size of the building and the climate zone. 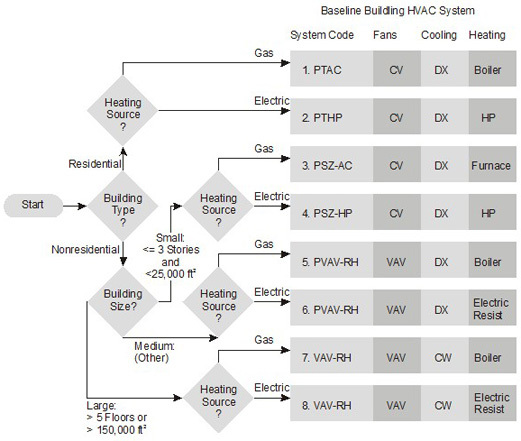 The baseline HVAC system type for each building type and size is shown in Table 3.1-1. Table 3.1-2 shows the baseline HVAC system type for special space types. Details about these baseline building systems are provided in Table 3.1-3 and subsequent sections of the MGP. Dormitories, hotels, motels, and multifamily buildings of four or more stories. Houses of worship, auditoriums, movie theaters, performance theaters, concert halls, arenas, enclosed stadiums, ice rinks, gymnasiums, convention centers, exhibition centers, and natatoriums. Guest rooms, living quarters, private living space, and sleeping quarters. Spaces with heating only systems in the proposed design, serving storage rooms, stairwells, vestibules, electrical/mechanical rooms, and restrooms not exhausting or transferring air from mechanically cooled thermal zones. Total laboratory exhaust rate greater than 15,000 cfm. 1. For purchased chilled water and purchased heat, see G3.1.1.3. 2. Where the proposed design heating source is electric or other, the heating type shall be electric resistance. Where the proposed design heating source is fossil fuel, fossil/electric hybrid, or purchased heat, the heating type shall be hot-water fossil fuel boiler. Most building descriptors have a one-to-one relationship between the proposed design and the baseline building, for example, every wall in the proposed design has a corresponding wall in the baseline building. For HVAC systems, this one-to-one relationship generally does not hold. The HVAC system serving the proposed design and the baseline building may be completely different, each with different components, heating source, etc. For systems 1 through 4 and 9 through 13, each thermal block shall be served by a separate system. For systems 5 through 8, a separate air handler shall serve for each floor. Mixed use buildings (G3.1.1b). If a building has a subordinate occupancy with a conditioned floor area of more than 20,000 ft², then the HVAC system type is determined separately for the subordinate occupancy. Special spaces in buildings (G3.1.1c). Systems 3 or 4, depending on the climate zone shall be used for spaces that have occupancy, process loads or schedules that differ significantly from the rest of the building. Examples are natatoriums and security stations. This exception does not apply to computer rooms. The threshold for internal loads is a difference of more than 10 Btu/h-ft². The threshold weekly operating hours is when the difference is more than 40 hours. Laboratories (G3.1.1d). For laboratory spaces with a total exhaust rate of 15,000 cfm or more, the HVAC system type shall be 5 or 7 (depending on the size of the building within which the laboratory space is located) serving only the laboratory spaces. See Table 3.1.2-2. The lab exhaust fan shall be modeled as constant horsepower reflecting constant-volume stack discharge with outdoor air bypass. Heated only spaces (G3.1.1e). Systems 9 or 10 (depending on climate zone) shall be used for spaces in the rated building heating with no cooling system. This applies for heated only storage, stairwells, vestibules, electrical/mechanical rooms and restrooms not exhausting or transferring air from mechanically cooled thermal zones. Cooled Spaces in Unheated Building Types (G3.1.1f) If the baseline HVAC system type is 9 or 10, all spaces that are mechanically cooled in the proposed building design shall be assigned to a separate baseline system determined by using the area and climate zone of the mechanically cooled spaces. Computer rooms (G3.1.1g). Large computer rooms shall use either HVAC system type 11. The threshold is total computer room peak cooling load of more than 600,000 Btu/h where the baseline HVAC system type is 7 or 8 and a threshold of more than 3,000,000 Btu/h for other baseline building systems. All other computer rooms shall use System 3 or 4. Hospitals (G3.1.1h). The baseline system for large hospitals of more than 150,000 ft² or more than 5 stories shall be HVAC system 7. The baseline HVAC system for other hospitals shall be system 5. When the rated building uses purchased heating (hot water or steam) and/or purchased chilled water, then the same chilled water, hot water or steam shall also be used in the baseline the HVAC and the HVAC system mapping is modified as shown in Table 3.1.2-4. Based on applicable cooling system from Tables 6.1.2-1 through 6.1.2-3. Based on applicable Heating system from Tables 6.1.2-1 through 6.1.2-3. System 7 will be used in place of System 5. - System 7 will be used in place of System 5. A baseline building is not used when COMNET is used for Building EQ.